This would be the first information of its kind that I would ‘stumble upon’. 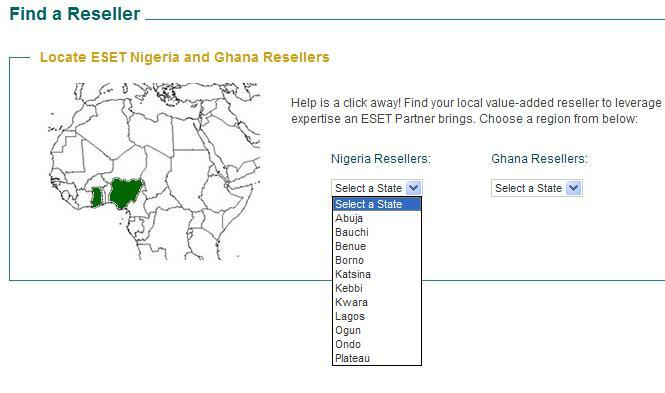 Too good to be true, but Licenses for the Eset Antivirus can now be purchased in Nigeria. But sure to make life easy: ESET Nigeria Ltd, a division of Arit of Africa Ltd.
ARIT OF AFRICA is a Value Added Distributor providing IT Security Solutions and Services in the region of Nigeria and Ghana . We work closely with our channel partners to enable customers to protect their data. With offices in Lagos , Abuja , Ibadan and Accra , ARIT OF AFRICA today is reputed for Sales and Support of Computer Hardware, Networking, Servers and Storage Solutions, Security Solutions, Printing Solutions and Maintenance & Support Services.